This dual stage juicing system allows you to extract as much juice from your ingredients as possible, leaving you with the driest pulp. A little noisy but not like a centrifugal juicer. The Omega J8006 stands out amongst other models in the J-series and happens to be a best seller. 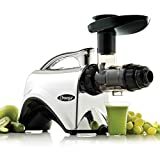 Featuring a powerful 2HP motor, which operates with an 80RPM slow speed, this juicer leaves you with a juice which can be stored for 72hours with all nutrients retained. 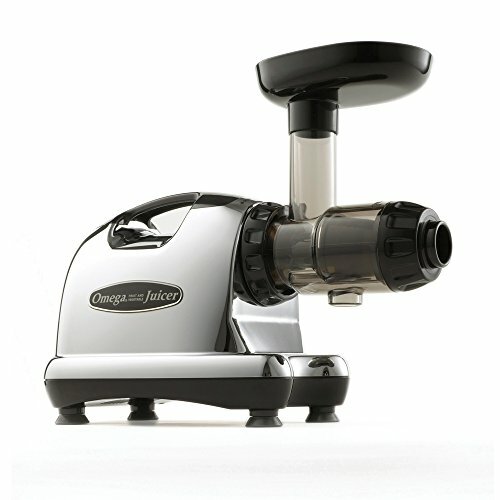 Just like most J-series juicers, it is designed with an 8X stronger auger. If you want to include some basic food processing to your juicing lifestyle, then you will get it right with his one. With the Omega J8006, you can be sure of grinding coffee and spices, making baby food from natural and fresh ingredients, pasta strings through extrusion, whip up soy milk, and mince garlic and herbs. It measures 14.5 x 6.5 x 15.5 inches and weighs 17.6 pounds. Basically, most omega j-series models are quiet masticators because they run on slow speed. However, this one is a little noisy. You have nothing to fear as you are covered with their 15 years warranty.